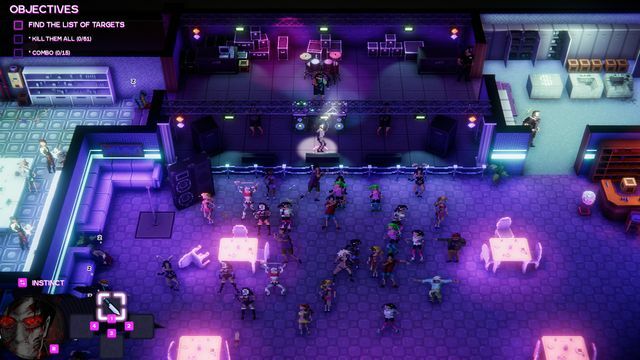 A sleeper hit coming in on the coattails of the pixel graphic rage–the first Party Hard landed as a massive success, and certainly has a fan base to boot. You play as the Party Hard Killer, intent on stabbing your way brutally through various gatherings. Nobody will ever see it coming, but you better hope they don’t spot you after! So lets start with three questions I tend to ask when a sequel comes out: what’s old, whats new and is it worth it? 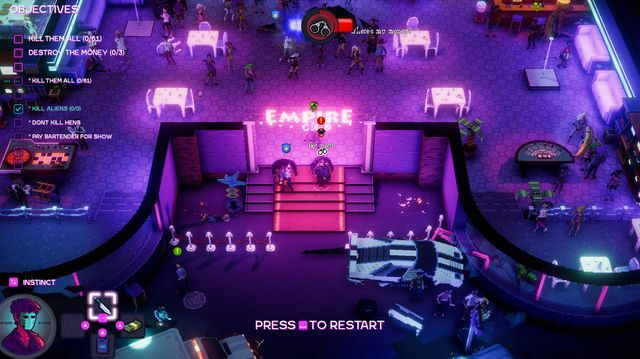 The old Party Hard stabbing mechanics are ever the same–every knife hit you land feels so devilishly satisfying as you rip your way through vapid party-goers. The levels are with one foot in the old and one in the new–structured like the first Party Hard with expansive dance floors filled with unsuspecting people and cops just waiting to come out of their doughnut holes and bust you. The music is always a highlight. What’s a good party without a great soundtrack? I’m always amazed at how catchy the tunes are in these games and how effective they are to get you in the mood for some festive mayhem. 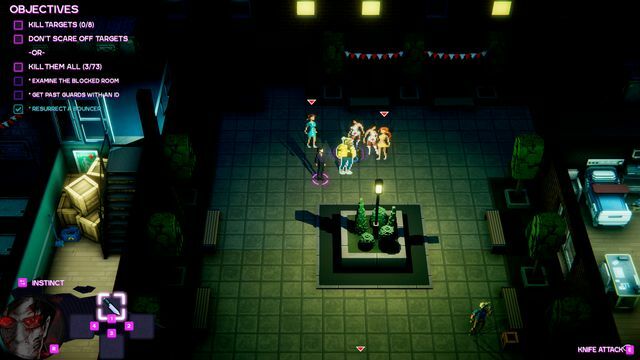 You also still have a fantastically eclectic cast of NPC characters milling around–in Party Hard, pop culture really was king when it came to the NPCs, but Party Hard 2 seems to have more of a independent cast of original design. Speaking for the new: the levels themselves are MUCH larger. Gone is the static one board feel with fully structured buildings and plenty of side rooms to pique your curiosity. 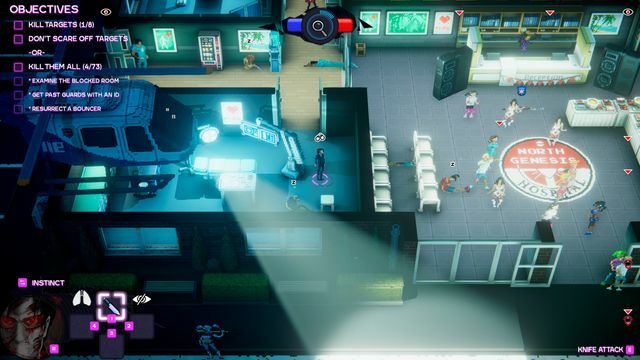 You can even walk across the street in many of them to find another area with more targets, and plenty of other bits and bobs to set the scene. 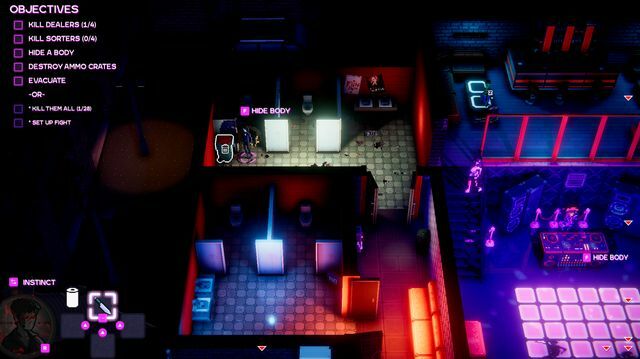 The cool thing about the space is what’s filled within it–Party Hard 2 has taken the interactive objects (like explosive speakers, poison punch) and tripled the amount of things to use at your disposal. 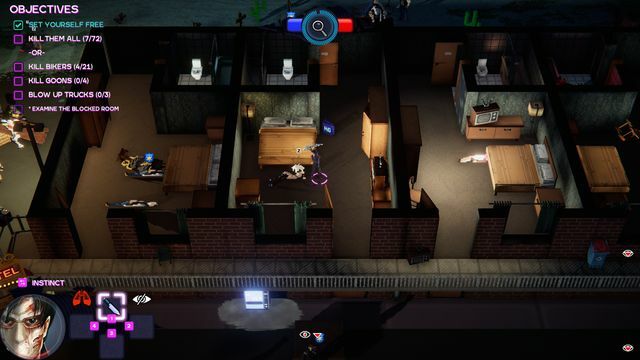 Objectives, aside from killing everyone, have also made their way in. Now, you’ll have tricky extras–don’t frighten the guests, or get into a restricted area with a certain ID keycard. It’s really smart and after playing the game to kill, adds plenty of incentive to come back and play again to try for a challenge. There are a few interesting boss levels sprinkled in now as well, to my pleasant surprise. You have to use certain tactics and exploit weaknesses just like any other boss, but the tricky nature of the situation makes for a interesting time. Co-op has also been introduced. 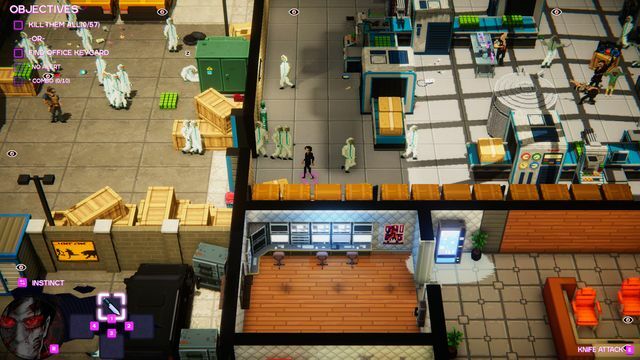 As this is a game that you have to have sharpened senses for–you and your co-op partner have to be on the same page as you work your way through each level. I have to say, the co-op is an absolutely fantastic time. It really is so much fun to conspire together and accomplish the levels as efficiently as you can. In a lot of cases, I would say co-op is a lot easier than playing solo, but like I said before–if you and your partner aren’t coordinated, things can get very ugly, very quickly. 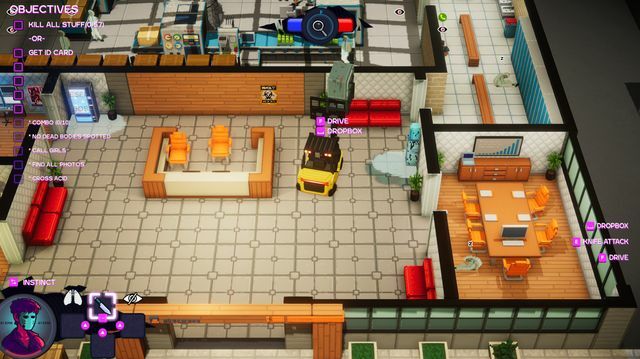 Unfortunately, there’s a handful of work yet to go before Party Hard 2 feels polished. 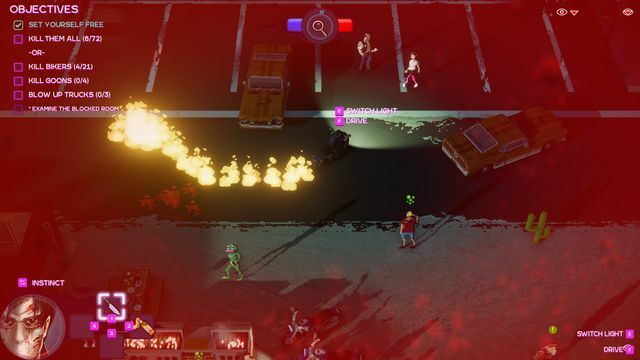 The co-op mode isn’t without it’s major bugs, and although these are workable around with a bit of finesse, things can go a bit pear-shaped as you play. There was many times I had to restart levels because some of the co-op exits didn’t register, or other strange happenings like floating above the level before it began. These all seem to be getting taken care of in real time however, with Pinokl Games having an ear to their Steam discussion forum and a Discord for direct contact on bug reports and everything in between. 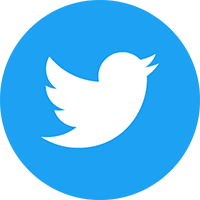 About a week ago, there was a near game-breaking bug that I watched be reported (followed as well, for it was taking hold on me) and within a day or two it was sorted and back to working order. 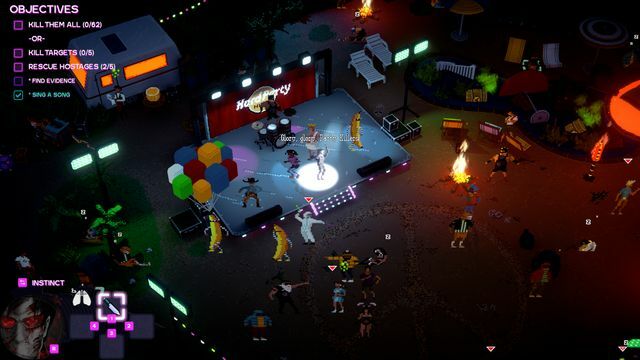 Party Hard 2 is a evil good time, and I wouldn’t miss it for the world. Being such a huge fan of the first game, it goes without question that this one had to be in my library. Is it worth it? Purchasing it now, you might see a fair share of bugs that haven’t been squashed yet, but the outlook is pretty good for it to eventually be the game it should. If things like this bother you, perhaps waiting a couple of weeks will do the trick, but even then I can’t go without recommending it. It’s silly, it’s bad and it plays different every time. 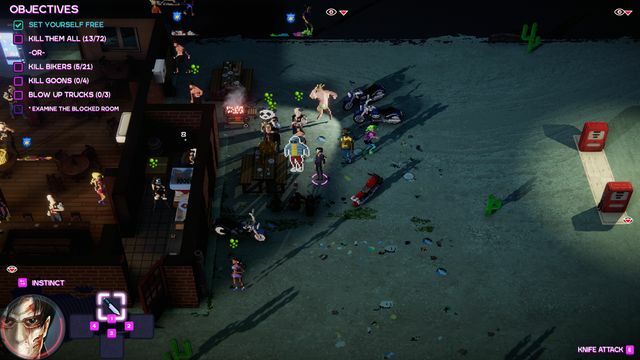 Speaking on the score below, I find myself conflicted–Party Hard 2 is easily a 4.5/5, but with all the problems still plaguing co-op I have to drop it a half point to 4/5. This is due to the existing bugs, and wishing so hard it could be ran on native Linux. (Lutris isn’t for the faint of heart, but CAN get it in working order). If fixed, this addictive title can easily find itself eclipsing the first instalment to the series–here’s to hoping for DLC so I can keep the party going! 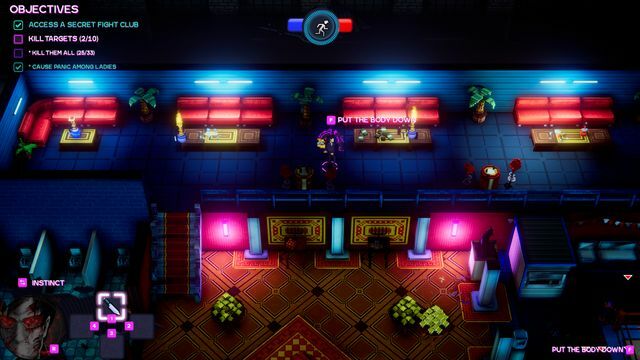 Party Hard 2 was reviewed using a digital code supplied by the publisher.